The interest in aviation sparked by demonstration of the Wright Brothers' plane led to a series of international flying meets where aviators competed for speed, duration and altitude prizes. 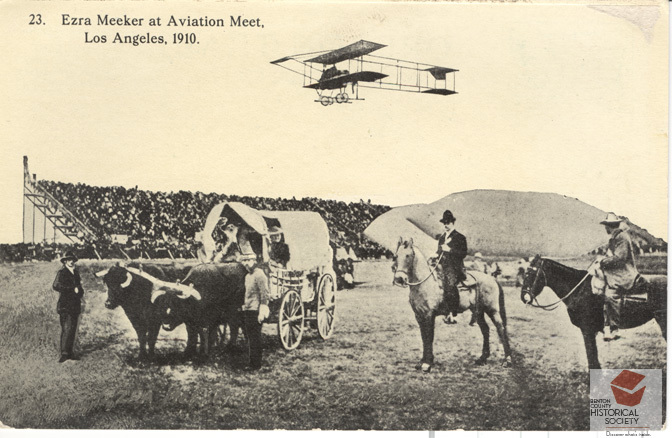 The first such meet in the United States took place in Los Angeles in 1910 and featured airships (on the ground behind the men on horseback) and planes such as the Farman III biplane flying overhead. Highlights of the meet included Louis Paulhan setting a world altitude record of 4,165 feet in his Farman plane and Glenn Curtiss setting a speed record of 55 miles per hour.